Indian weddings are so much fun to shoot with all the vibrant colours and rich cultural depths at each step of the wedding. Lately, I had the pleasure to shoot a Marwadi wedding which was so unique in its own way. Marwariweddings are an extravagant affair and this can be proved with the authentically impressive decor, sumptuous feasts, expensive attires, lustrous ornaments and elaborate wedding ceremony. The wonderful cultures and rituals are so different from those performed by other religios communities in the rest of India. Each part of the ceremony is named and performed a bit differently. I have briefly described the main ceremonies below with my relevant photograph from this wedding shoot. The engagement ceremony is called 'Tikka' which usually takes place at the bridegroom's residence. It is attended by the bride's father, brother and other close relatives. 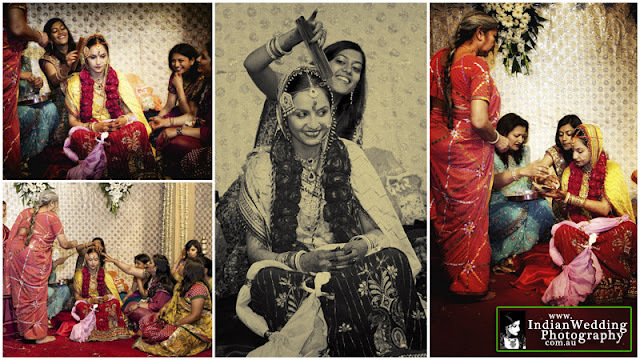 In the olden days, none of the ladies including the bride accompany the men folk for the tilak ceremony. 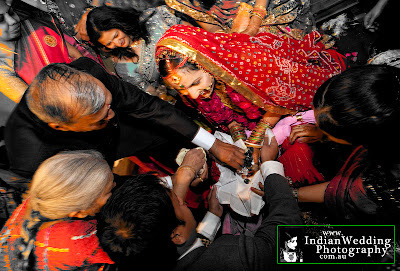 In this ritual, the bride's father applies tika on the groom's forehead. Clothes, fruits, sweets, sword and other gifts are presented to the bridegroom. 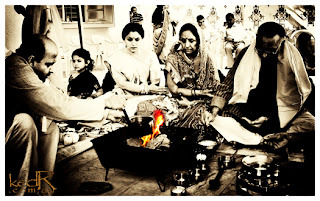 A havan is conducted by the bride/groom's family, which involves the installation of the idol of Lord Ganesha. This ceremony takes place a few days before the wedding. It is said that applying Pithi (herbal paste) enhances the complexion of the bride and groom. In Pithi Dastoor ritual, paste of turmeric and sandalwood is applied to the bride and groom in their respective homes, after which they cannot move out of the house. The bride wears an orange color poshak. She is then brought under a silken canopy. It is held by four women belonging to the same clan as the bride, using swords in the four corners. The paste is then applied to the bride. In the granthi bandhan, the cloth tied to the waistline of the groom is opened and one of its ends is tied to the chunni of the bride. This is symbolic of the union of two individuals into oneness. The sister of the groom or the priest generally ties the two cloths together. The granthi bandhan is followed by the 'paanigrahan' ceremony, wherein the groom takes the hand of the bride in his hand. The union of two hands symbolizes that the two would be together in both the good and bad times. This is normally followed by the 'Pheras' where the bride and groom take circles around the sacred fire while the pandit recites the mantras. In olden days 7 circles were taken, now usually it is 4. At the end of the Pheras, the bride and groom speak seven sentences which are promises made to remain together in good or bad. Thereafter, 'Sargunthi' or adorning of the bride's hair is performed. The groom's female family members use sacred sticks to apply hair on the bride's hair which indicates the acceptance of bride by the groom's family. This ritual indicates that the groom's family will support the bride financially and welcome her as their family member. In the 'aanjhala bharai' tradition, the father in law of the bride puts a bag full of money in the lap of the bride to signify her future responsibilities and errands. Thereafter, the family blesses the new couple for their future life.